Product Blitz’s advertising campaign for Cafe con todo has resulted in a surge of new customers and a fast way to grow a subscriber base through intelligent advertising. Product Blitz was hired by Cafe Con Todo to jumpstart the growth of their newly-founded Coffee Shop in Seattle. This was solely down through Facebook ads combined with Facebook chatbots. Coffee shops are a low-margin business and many of them do not survive after 6 months. The owner of the coffee shop wanted to ensure his had great chances of surviving, but also thriving as a core coffee staple in Fremont. The objective was to get as many new customers as possible and increase the overall brand awareness of Cafe Con Todo. Cafe Con Todo had hardly any marketing strategy outside of connecting with a couple of influencers in Seattle and cross-promoting it to the members of its dance club (Cafe Con Todo turns into a dance studio at night). What they needed was a scalable strategy towards getting people into the coffee shop at a relatively low price point. Targeted Facebook ads was the approach to take from the beginning. Many restaurants and food-related businesses typically advertising great offers as a means to getting people in the door for the first time. Product Blitz had plans to do something similar, but we wanted to do things slightly different in a way that we've never seen done before. We advertised free coffee. The first photo on the left is what our best performing advertisement looked like (after lots of testing). The offer is simple: tap the photo and we'll send you a free coffee coupon. After the viewer taps the photo, they are sent immediately to Facebook messenger where they are greeted with the message in the middle photo. The user confirms they want the offer by tapping the 'Free Coffee' button shown. Afterwards, there is an automated message that explains the detail of the offer (bottom half of the photo), along with the coffee coupon, which is shown on the photo in the right. When the user comes into the coffee shop, the barista taps the 'Redeemed' button, which makes it clear in Facebook Messenger that the user claimed their offer (so they can't reuse it). Above are some additional parts to the chatbot. On the left photo is a reminder sequence that would go out to people who didn't redeem the offer if it was expiring soon. This was critical in getting people to show up to Cafe Con Todo. On the right was an additional offer to those that redeemed the coffee coupon. Once the user redeemed their free cup of coffee (and came into the shop) a day later they would get an offer for a free drop-in dance class of their choice. They would receive the same style of coupon as the free coffee offer. The whole idea of this strategy was to offer free things up front to get people in the door and realize that Cafe Con Todo exists. It wasn't a strategy towards making a lot of money in the short-term, but building brand awareness for long-term gain. The goal was that more people would come back to Cafe Con Todo and spend money if they were exposed to all its offerings first. 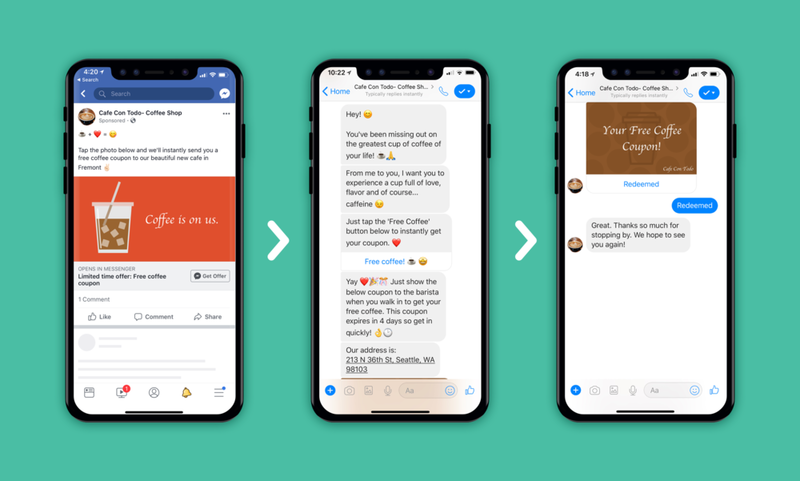 It also helped build a messenger list (similar to an email list) for the coffee shop, which can be used as an advertising medium to promote offers and services. In the one month trial run that has been done so far, the results have been promising. The average cost for a coupon request has been roughly $1 and the cafe has seen a surge of new people walking through the door. The first ad was published late Thursday night and by 6:00am the following morning, people had already come in to redeem their coupons! Over time as more variables are tested both in the advertisement copy and the chatbot messages, the results will continuously improve as we try to get people in the door at the lowest possible cost. Free coffee: The nature of the offer is very enticing and for the average coffee lover, is hard to resist. However, to make this as efficient as possible from a cost standpoint in the way we did it, how the offer is executed is vital from an ads standpoint. Constant ad testing on Facebook: As for the ad itself on Facebook, close to 20 different ads were tested between different photos/videos, ad copy, audience targeting, and more. At the end of the day, we go with the ads that performed the best based on the lowest cost-per-click. It took a lot of testing to determine what those ads looked like. Copywriting testing on Facebook messenger: Sure, someone out of instinct sees an awesome offer on Facebook and clicks on it, but how do you increase the percentage of people that actually opt-in to receive the offer when sent to Messenger? Through the right initial message (shown above) we were able to increase the conversion rate from 50% to 66% by writing a more engaging, captivating message. This was huge for our bottom line. Limited time offer: The idea of coining something has limited time makes it seem like a big deal that people don't want to miss out on. You have to act soon, so you better do it now! This was combined with creating an offer expiration date of 4 days after it was requested to encourage people to visit the coffee shop very soon. Reminders: As shown above, an automatic message was sent to users who didn't redeem the coupon the first few days to let them know that the offer was about to expire soon. Reminding people helped increase the percentage of people that actually showed up to redeem the offer (because they otherwise might have forgot about it). Using Facebook Messenger: Messenger is an amazing alternative to email for redeeming offers because the opt-in is super simple. You don't have to enter your name and email, but rather press two buttons. This increase the conversion of rate of people who actually opt-in and request the offer because it's a lot less work. I'll also add that getting people into your Facebook messenger list as opposed to an email list is more valuable because a much higher percentage of people will engage with you and open your stuff. That is because almost everyone checks their text messages and through the right experience on Facebook Messenger, it can be highly engaging. There were a lot of factors that played into the success of the campaign. The best part is I have so many more ideas on how to create an even more effective marketing strategy through this for other coffee shops and related businesses.